A new publication reporting the experience that people with #aphasia had in #EVAPark has been published in ACM Transactions on Accessible Computing (TACCESS) volume 10 Issue 4, October 2017. 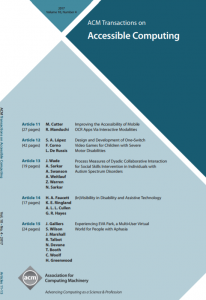 Free open access download available. Overall, the study showed that participants in EVA Park experienced positive emotional and social outcomes. We argue that this was achieved as a consequence of EVA Park being an accessible, varied and entertaining environment, where people with aphasia experienced both the realistic and the quirky, engaged with others, and had fun. 1 Pings/Trackbacks for "New publication reporting user experience in EVA Park"